Many times we all see people using GIS in a way to make a point. We all know maps lie so that is why special interest groups take to maps more than any other format. I happened to see a link on Ogle Earth showing the worst gerrymandered districts in the U.S. Congress. I’m not saying that this information is not useful, but when you add a statement like this on your readme it shows either you are uninformed or you have an ulterior motive. 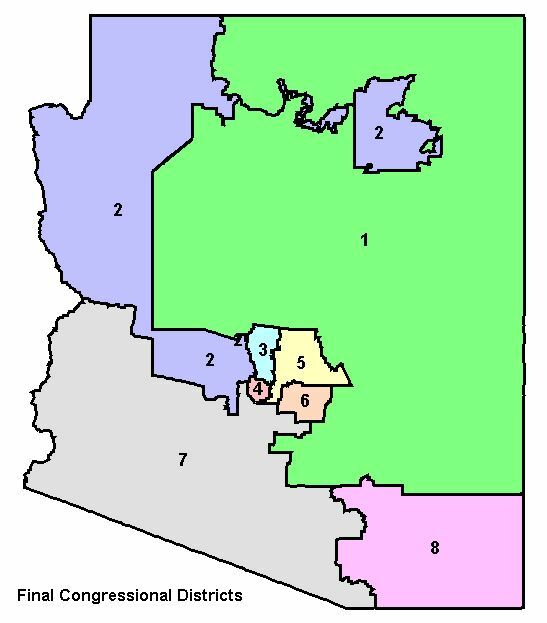 OK, I can’t speak to other states, but Arizona has an Independent Redistricting Commission made up of five members: two Democrats, two Republicans, and one Independent. They look at many factors and try and eliminate gerrymandered districts. OK so why did they end up with Arizona Congressional District 2? Well there was a huge feud between the Navajo and Hopi tribes about representation and the Hopi Tribe was worried about being canceled out by the larger Navajo tribe in Washington (there is much history here between the two tribes so you might want to read up a little on that to see what this is such a big deal here in Arizona). So that is why you have the second district running all the way around the mollogon rim to get to the Hopi Reservation (take a look at this map on the Hopi visitor page. Now you see what that district includes). Beyond that issue, you also have to deal with a very urban state. Most of the population of Arizona is in the large cities of Phoenix and Tucson so you have to work around including millions of acres that have almost no population with those compact highly populated counties of Maricopa and Pima. The Arizona Independent Redistricting Commission is tasked with creating competitive districts so in a state like Arizona, you’ll end up with districts that will have a little gerrymandering in them to try and capture equal votes. Sure that doesn’t explain district 2, but as I said the Hopi/Navajo feud is a very big deal. Oh and guess what? The Arizona Independent Redistricting Commission uses GIS to distribute the district boundaries in a fair method and provides Shapefiles and even Maptitude files for citizens to review. You can bash the legislative districts all you want and I’ll agree there are some really bad ones out there, but to blindly include Arizona’s Second District and claim that the citizens of Arizona don’t understand the issue is an insult to everything we have done here. The citizens of Arizona voted for Proposition 106 in the 2000 General Election for the purpose of creating competitive districts. I have to question the motives of the creator of this Google Earth KML when the call out a district in a state that has voted for an independent redistricting commission. Either they don’t have a clue about what they are talking about or they have an ulterior motive beyond fair districting. Lets take one quick look at the Arizona Congressional District Map. Knowing what you now know about the Hopi/Navajo issues, I think you’d say that the Arizona Independent Redistricting Commission did a very good job, don’t you? Update - Thanks to b99 in the comments of this post for finding the actual 2006 Georgia redistricting plan which as you can see is very different from the one presented in the Google Earth KML. Yet another nail in the coffin of this KML exercise.